A chemical peel can be beneficial not only for your facial skin but to also improve the appearance of the skin on your hands and neck. Peeling is a very old technique which is still being used for skin rejuvenation. In old times, sour milk and wine were some of the most popular ingredients for facials as well as beauty baths. As the name suggests, these peels remove the upper layer of the skin which is dead and impure in order to grow new skin layer in its place which will be young, plump and radiant in comparison to the old top layer of the skin. 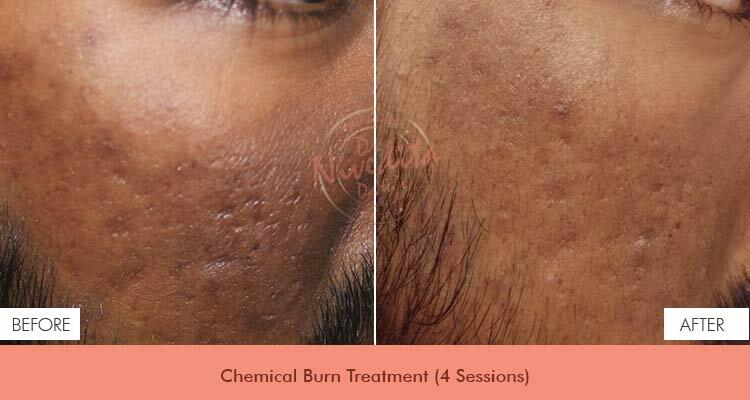 Dr. Nivedita Dadu’s Dermatology provides you an advanced chemical peel treatment to do away with skin pigmentation once and for all. You’ll be amazed to see how fresh and enhanced your skin colour & texture will be. White Peel is a very potent & safe peel system. It’s main indication is in view of its benefits in melasma , photo aging & it also promotes even skin tone by reducing hyperpigmentation & return skin its natural brightness by stimulating cell replacement. Procedure for peel is started with thorough cleaning of facial skin followed by removal of surface dead cells by microdermabrasion to improve penetration of peel . The peel kit has two steps where step one is chemical exfoliation by evenly spreading the liquid on skin. Followed by second step where application of actual peel is done, leaving it for 10 min & then advising the patient to remove after 8 hrs with plain water. It is a simple procedure with no irritation retorted & no long-term side effects. Best dermatology treatment and effective results.